Safety performance is a complicated issue, particularly in high-hazard environments, where time and other constraints can be amplified, and result in numerous impacts. From an organizational and business perspective, safety and production/performance are often seen as competing goals. When production is increased, safety defenses and barriers frequently decrease, and when programs are developed in an effort to improve safety, employees may be unable to meet production goals within the safety constraints. 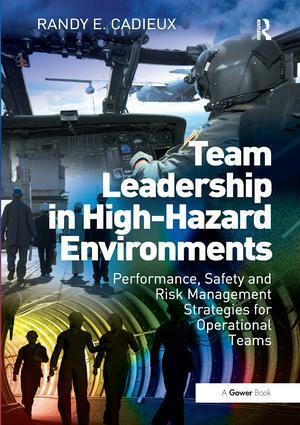 Team Leadership in High-Hazard Environments recognizes these difficulties and constraints and proposes an approach to safety leadership in which safety and organizational performance are inextricably linked; one that addresses safety from both the systems and human factors perspectives. To that end, Randy Cadieux introduces the nine essential components to team leadership. By studying these areas and using the information in each chapter, organizational leaders, managers, and supervisors will gain an understanding of key factors that will help them design, develop, and implement team training programs that improve the way employees work together and the way they mitigate hazards. Additionally, the book describes how work systems and work environments may be designed or shaped so that teams are placed in a position to do their optimal work, maximizing the potential for human and team performance. This is an important book that draws on techniques and models developed from Crew Resource Management, human factors, risk management, as well as more traditional HR management disciplines. Randy Cadieux is the Founder of V-Speed, LLC, a leadership, risk management, organizational resilience, and team performance consulting and training company, and is the developer of V-Speed’s Team Leadership and Resource Management training program. Randy is also the Program Manager and an Instructor for the University of Alabama at Birmingham’s Master of Engineering in Advanced Safety Engineering and Management program. Randy is a 20-year veteran of the United States Marine Corps, where he served in multiple roles. His primary occupational specialty was as a KC-130 Hercules pilot and he had numerous other leadership roles in the areas of aviation, operations, and safety. Randy has experience with a range of safety, operations, and human performance training and application methodologies, including Marine Corps aviation operations planning, Operational Risk Management, and Crew Resource Management. Randy holds a Master of Engineering in Advanced Safety Engineering and Management from the University of Alabama at Birmingham, and is a member of the American Society of Safety Engineers and the International System Safety Society.